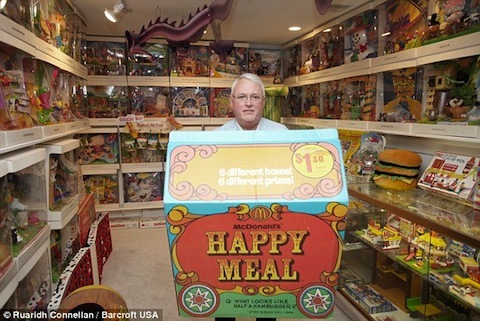 The McDonald's owner has spent almost 50 years of his life collecting all things McDonald's related. Mike Fountaine has compiled some compelling evidence that he’s lovin’ it more than anyone out there—he has a 75,000-piece collection of McDonald’s memorabilia that’s fully catalogued, organized in 389 categories, and neatly displayed over two miles of shelves. In addition to the two miles of shelving spanning nine rooms in his house, Fountaine has recently built a 2,400-square-foot barn to store it all. In total, his collection now takes up around 7,000 square feet of his property. Of course, ridiculous food hoarders are nothing new. This guy has a 1,000-piece hamburger collection that features a hamburger Harley bike, and this guy has more than 600 different pizza boxes from over 45 countries in the world. But 75,000 pieces of Mickey D goodies? Fountaine may be in a league of his own.